Sometimes it's the failure that teaches us the most. I don't know about you, but I'm realizing that I have an issue with not wanting to disappoint people. That is not solitary to life, but (being that work often feels like a part of me), it's most definitely a part of work too. One of the lessons that I'm working toward right now is how to be ok with that a little more. To give myself a little slack and admit that sometimes, I've done the very best that I can do and that's just not going to cut it. To learn from those mistakes and move on. This ring was a big one for me. It felt like pushing walls away in a lot of different directions and just when I thought I had it.... Well, read on for the full story. The original concept was meant as a Mother's day gift to commemorate the birth of a couple's first daughter. 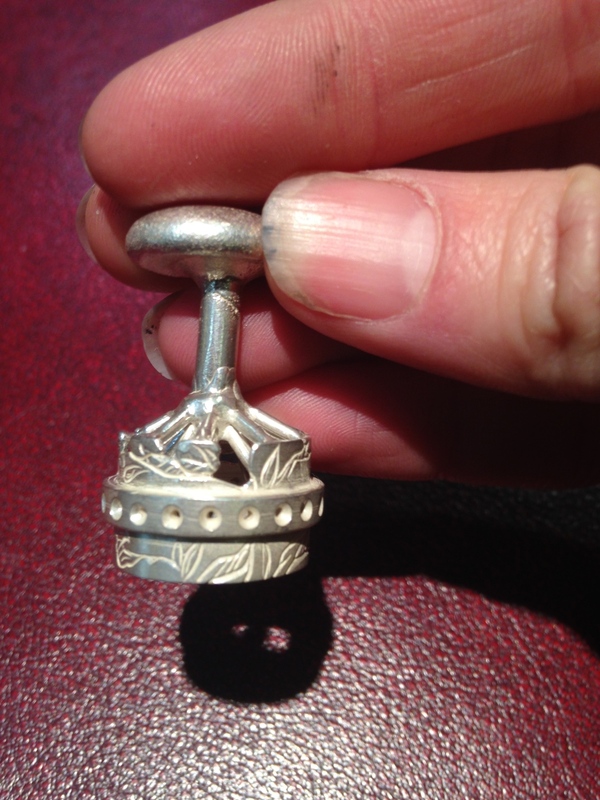 Mom liked the idea of a pattern of vintage lace so I did a wax carving and cast it in Sterling silver. Next step was to make a 14K band that was meant to honor the marriage vows. Finally, an infinity band of Topaz (the birthstone of their daughter), set in 14K white gold. The idea was that these were all meant to fit together and the two smaller bands would spin atop the silver one. In order to get them to fit I pushed these to the very limits of what made sense from a structural standpoint, and finally, just barely, it all fit together. They spun, they worked, I felt good about the work and problem solving that had gone into it. I flared the ends, polished it all, gave it one last look and sent it on it's way. After all that excitement, when it arrived and she went to try it on... it didn't fit her finger. Somewhere in there our sizing had been confused. I'm not sure that the word disappointing even covers it... but ok. Let's try again. Well, I tried again, and again, and again. Simply making the size bigger changed the proportions of everything else. Sizing up the infinity band would make it stick out too far and make the piece uncomfortable between her fingers. I carved a new sterling band but this time the thickness of the silver band wouldn't allow for setting of stones. The flaring of the ring felt strange when worn. The design was reinvented many times until finally I thought "this time!'. The excitement bubbled up all over again. Things didn't work out that way unfortunately, and this time was a whole new set of problems when the piece didn't cast properly. There are a multitude of reasons why that might have happened but ultimately the couple and I just decided to scrap the project. They get a refund, and I get two pieces for my personal collection. One that's been a beautiful challenge and the other that was a beautiful failure and yet both are good reminders. There's still a part of me that wants to try again, just for the sake of doing it but I am also realizing that it's ok to fail. Sometimes the things we want most to work, don't. Knowing that these times are rare, and we did our very best. So do we beat our selves up for those failures? Or, do we chose to pick ourselves up, be gentle with our defeats, and move on?